First of all, I know Sara mentioned Monday’s post in her post on Wednesday, but I just wanted to thank all of you so much for your sweet thoughts and also for opening your hearts and sharing similar stories. So many of you mentioned that because there were so many comments, I probably wouldn’t see what you wrote, but I promise, I read every single one, some of them more than once. I wish I could respond to all of them personally, but please know that I read and appreciated everything you guys had to say more than I can express. So this recipe is kind of almost too good to be true. I found it on Weight Watchers a few months ago and it quickly became one of my very favorite meals–it’s hearty and delicious and forgiving and quick and easy and unbelievably low fat and calories and once you track down the lentils and all the spices, you can make it again and again with very little effort. One thing I discovered is that Weight Watchers gives this 6 points, but when I calculate it one my own, it comes in much lower than that. One factor is that they say it serves 6, but those would be huge, belly-ache-inducing servings, so I calculated it for 8, and even then, those servings would be quite large. But the numbers still didn’t add up. Using the nutritional info from the bag of lentils, and calculating it with 8 servings, it comes in around 2 points and under 90 calories. I told you it was almost too good to be true. You’ll need lentils (red ones, if you can find them–check the “natural” section of your grocery store, although your cheapest bet will be in the bulk bins or a Middle Eastern market), an onion, fresh garlic, fresh ginger, spinach (fresh or frozen), a 15-ounce can of tomatoes, cilantro, and lemon or lime juice. Plus a bunch of spices. These can be kind of a pain to track down, but once you have them, you can make this over and over again with practically zero effort. You’ll need mustard seed, ground coriander, ground cumin, and curry powder or paste. I prefer the paste, even if it’s Thai and not Indian. Cook on high for 3-4 hours or on low for 6-7 hours. 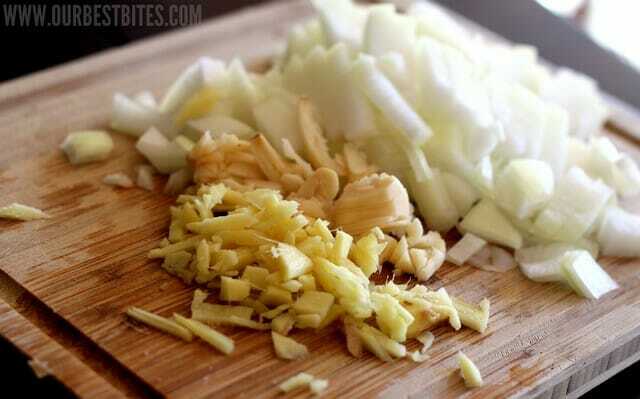 You can also bring it to a boil in a large stock pot and then cover, reduce heat to low, and simmer for 1 hour. When the lentils are done cooking, stir in a handful of chopped cilantro and the juice of 1/2 a lime or lemon. Ladle it into bowls (I like it over rice cooked with onions, garlic, and chicken broth) and enjoy! Looks delicious! Is it spicy? My mom is crazy for lentils but cannot handle any spiciness whatsoever. The cayenne adds the heat, so you could either omit it or cut way back on it. This might sound silly, but what do you do with the ginger? I have bought fresh ginger more than once, but I’ve ended up wasting it each time because I don’t know what to do with it. Do you guys have any tips or tricks? Also, you have mentioned that you’ve been losing weight recently so I would like to share that, with LOTS of recipes from you two, I am down 75 lbs! Please keep healthy recipes like this coming!! Amy – When I buy fresh ginger, I peel the whole piece and then keep it in my freezer. Then, when I need it, I just grab it, grate the amount necessary and stick it back in the freezer when I’m through with it. I just store it in a freezer ziploc bag. I PEEL IT AND PUT IT IN A ZIP LOC BAG AND FREEZE IT UNTIL I NEED IT. ALWAYS GRATE IT FROZEN; IT IS SO MUCH EASIER. IT WILL LAST A LONG TIME IN THE FREEZER. Amy you can put the fresh ginger in a ziplock Baggie at put it in the freezer. Then when you need it just take it out (no thawing) use a peeler to take off the skin on the area you think you will need and the grate what you need with a fine grater or micro plane. I use ginger just on occasion so I just break off a smaller piece of ginger at the store or if you ask your produce manager they will cut you a piece. Hope this helps. Personally I break off about exactly what I need while at the store and do not buy the whole ridiculously large pieces they have set out. I think quite a few people do this because you can see the breaks on the ginger. However, if you’re not comfortable doing that you can put your remaining ginger in a ziploc baggie and close it up and pop it into the freezer and it will last you a good long time and be ready for you whenever you next need some ginger. HTH! Personally, I enjoy a few thin slices of ginger in my green tea. I also enjoy mixing it with cucumber slices and carbonated water, so I have a healthy fizzy alternative to soda. It also goes great if you are doing a stir fry. Store it in the freezer. It lasts a lot longer. Well, speaking as someone who grew up in India I can say that real Indian food has neither curry powder nor paste. Most Indians in India will have no clue what you mean if you mention curry powder to them. That being said, this does look like a good recipe, although closer to Middle Eastern-style lentils (which are yummy!). I could be more nit-picky about the ingredients, but I’ll stop there because this does actually look tasty, and, like I said, sort of Middle Eastern. 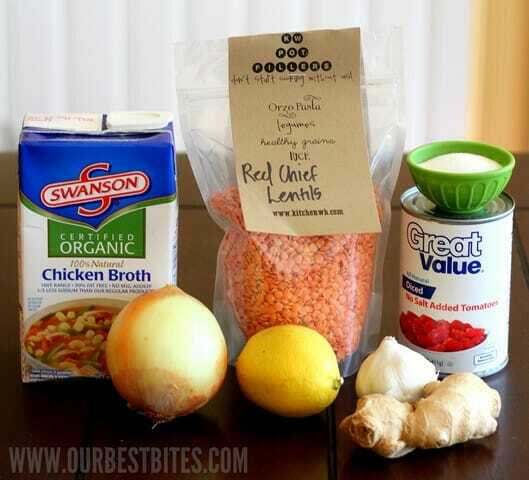 We’re lentils lovers in our house, so I’ll have to give this a try! Because curry powder is a mix of many spices adopted by British cooks who loved the tastes introduced to them in India – primarily: tumeric, fenugreek, coriander, cumin. Kind of like a Garam masala without so much masala. Mix your own if you can’t find a curry mix that suits. Cool! I was wondering the same thing because I have a random bag of green lentils in my pantry and have no idea what to do with them. If it ever stops raining/snowing I’m headed to the store for the rest of the ingredients. Actually, green lentils may taste fine but they won’t ever cook down into the rich, wonderful stew that red lentils so happily disintegrate into. Red lentils are truly worth looking for. Try Bob’s Red Mill on-line (or local if you live in the Pacific Northwest). This is very similar to another lentil recipe I make, I put it over rice but could never make it without making homemade naan bread! Spread with a little garlic butter, it is SO good. You can definitely adjust the spices to make it hot or not, I don’t make it hot at all and it’s still very flavorful with the other spices in it. This recipe looks delicious and I will be making it soon. I love it that you found it in a Weight Watchers cookbook. I found 2 Weight Watchers cookbooks at our Church’s Picnic. One is the daily recipes and one is the cookbook with recipes for entertaining. I love both of these books!! Neither has a recipe like this one and since my husband is diabetic, I love new recipes that are good for him to eat. He is the kind of guy who thinks if he hasn’t had red meat and potatoes, then he hasn’t eaten. So I always try to find something that will satisfy that hunger for the things he can have only in limited quantities. Thanks for sharing this recipe!! This is great! I have all the ingredients… We eat a LOT of curries, and a lot of your recipes and I was just saying to my husband ” I wonder if the OBB girls don’t like curries since there aren’t a lot of those kinds of recipes”. Also LOVE having the nutritional info on the recipe! Please keep that up! I’ve been recording the nutritional info for my cookbook as I go through the recipes this time around. I don’t see it listed as one of the steps but it’s important to rinse lentils really well before you cook them. This recipe looks yummy! This looks so good! Thanks for keeping it easy on us! This looks and sounds delicious! I have everything on hand except red curry paste, so I’m going to give it a go with green. 🙂 Thanks in advance for tonight’s dinner! I am not a fan of lentils but I wanted to comment and tell you how much I appreciate that you put the nutritional info at the bottom. I am doing weight watchers and having that already calculated for me is a HUGE time saver. I hope you will be able to do this with your future recipes!!! I was wondering the very same thing! I love the Madras Lentils–just bought a box yesterday, in fact! I just made this recipe yesterday because my daughter and son-in-law (both vegetarians) were home for the weekend. 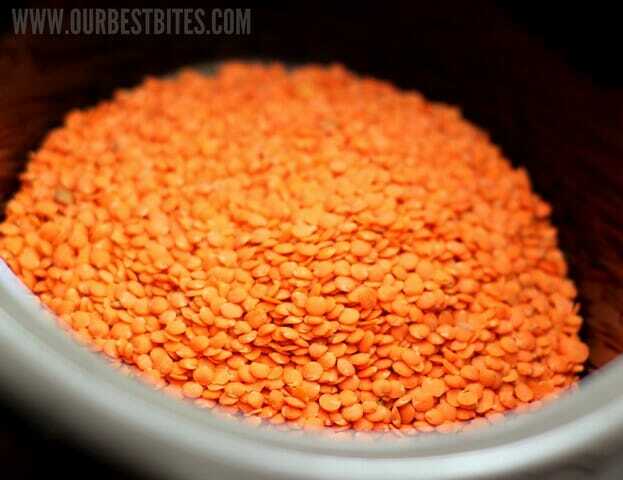 I have also purchased the Madras Lentils for them in the past when I’ve made a Costco run, so when my son-in-law commented that the recipe tasted a lot like the Madras lentils from Costco, he had a good basis for comparison. I loved that we were hanging out at home and got to smell this recipe cook for hours. We were all very anxious for it to be done and we certainly weren’t disappointed. Yummy! Ooh, I’m so happy to hear that! I’ll have to find some red lentils to try it (might become a new pantry staple 🙂 ). Thanks for letting us know the answer, Jennifer! Love the looks of this recipe. Even if it would add some points, I would probably stir in a can of lite coconut milk – i am partial to the smoothness the coconut milk adds. Hugs to both of you and your families! Ooh, good idea! I have some lite coconut milk leftover from making German chocolate cake frosting yesterday and just happen to have another pot of these lentils (yellow split peas, actually) going downstairs. Did you try it? And if yes, did the coconut flavor come through? Thanks! I am literally so excited to see this! Just bought bulk red lentils this week and was thinking soup, until I saw this recipe, which not only combines all my favorite flavors, I ALSO HAVE THEM ALL ON HAND! Yippee, thanks so much, can’t wait to try it this weekend! This is going to be dinner tonight! Adding some chicken to the crockpot though….I have a hard time giving up on meat at dinner time 🙂 That’s MY problem though. Thanks for the variety! I like introducing my kids (and husband ha!) to different foods. Just wondering if you could say why you prefer curry paste? 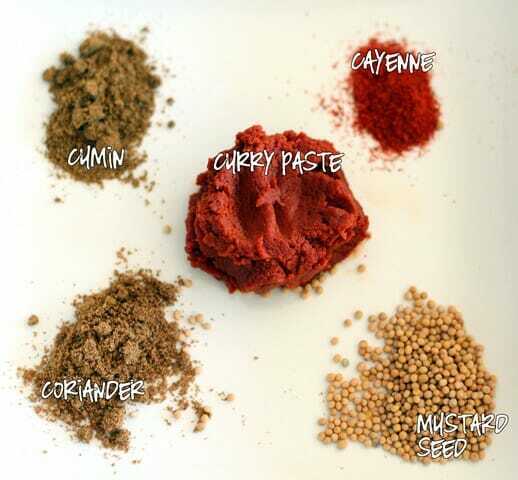 I happen to have curry powder but not paste and am wondering if it makes a big difference and if so, in what way? Also just a tip on the ginger. I read somewhere and have found to be true that you don’t even have to peel it before freezing or using. Just grate on a fine grater. Most of the peel won’t grate anyway, and the part that does, doesn’t hurt anything. Thanks for the great recipe. This is just what I’ve been looking for…new recipes to use while my husband and I are trying to lose some pounds. 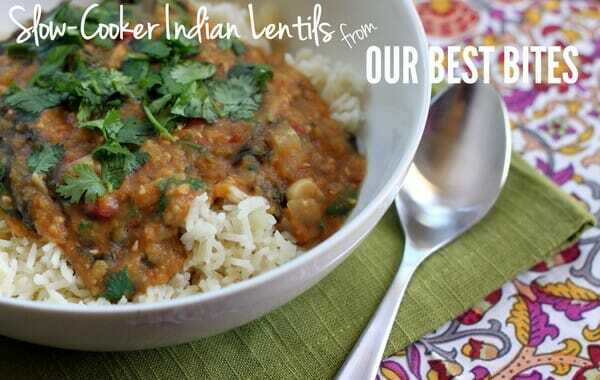 It sounds really good as well, and I have every single ingredient except the lentils. This looks amazing! I assume that the nutrition info you provided is just for the lentils correct? Not with the rice? Could that be why the Weight Watchers version was higher. Anyway, even if the rice adds another 4 points – that would be a super satisfying dinner for 6 points! I know that the recipe builder on ww tends to add more points especially if there are a few different vegetables or fruit. My leader always says let you weight loss be your guide. I’m taking your 2 pt value on this one. I just got a new crockpot and can’t wait to try it! This looks yummy! I’m always looking for more good meatless recipes, even though I love my meat. They all seem the same, so it’s nice to get something different! When you’re talking curry powder or paste, are you talking the spicy stuff? I just have the mild yellow curry powder–would that work here? Nope, just the mild stuff. They yellow curry powder is what the original recipe calls for, so it definitely works, but I just like the flavor of the red or green Thai curry pastes instead. Similar, but not completely the same. Hi y’all, I have question about this recipe. How well would it freeze? I am the only lentil-eating person in my household, but if this freezes well, it seems like it would be easy to store in lunch-sized amounts and heat up for my lunches. I know I would love it. I’m guessing it would freeze really well. If it’s too thick when you’re reheating it, just add a little water or chicken broth until you get the texture you want. I made this recipe this weekend and can confirm it freezes well. I store it in jars so that I can take it from the freezer, remove the lid, and micro it for lunch. I don’t even have to use a bowl, so it’s less to wash, and nothing to throw away. Delicious and smart. Thank you for the weight watcher recipe- keep these coming- so we know we can count on some good ones! Can you show us how you deal with the fresh ginger? My mom told me I could freeze it, but I’d love a step by step tutorial here on how you peel it and store, how long is it good, etc. Kate, have you ever tried Basmati brown rice? I’ve committed to eating only brown rice now and I like the idea of using Basmati rice with this delicious Indian recipe. I’m wondering if I could cook the Basmati rice using your fool proof brown rice oven method that posted a while ago? This was yummy! I cut the sugar in half. Other than that, I followed the recipe exactly. I Served it over brown basmati rice. I did use the “fool-proof baked brown rice” recipe to cook the brown basmati rice. It was good, it just came out a bit crunchy, mainly just the rice on the sides and bottom of the pan. Not sure if it needs more liquid or shorter cooking time? I used chicken broth instead of water, so I wonder if that affected it? I love Indian spices! I love lentils! And I just started Weight Watchers! This is perfect timing! Thanks! This sounds fantastic! I’m just wondering if you’d mind sharing how you made the rice (with the onion, garlic, and chicken broth)? Thanks so much! Sounds fantastic! Thank you so much for taking the time to write all this out for me. Can’t tell you how much I appreciate you two!!! We love Indian food, so this is a MUST TRY for my family. Thank you! This looks like a perfect dish to take for lunch now that it’s getting cold and I want something warm and hearty without being high in fat or calories. I usually buy lentils at Fresh & Easy. They have a good variety and their prices are awesome. Someone mentioned basmati rice and I am currently loving the O Organics Brown Basmati rice sold at Safeway/Vons/Randall’s stores. It requires soaking before cooking, but is totally worth the extra time. It’s delish. I haven’t adjusted to the fall weather yet and I’m sleepy from the cold. A nice lentil stew with those intriguing spices sounds deeply satisfying right about now. I haven’t tried this yet, but it looks great as always! Well, I said I was gonna make it, and I did. YUM. I love love LOVE these flavors together, just gotta tell myself to stop before I eat it all at once! Thanks again! This is delicious! I pinned it last week and made it yesterday while we were watching football. My husband and I were very happy with the outcome! Next time we are going to make it a bit spicier, though! This is very good. I used the vegan vegetable cubes and if anyone does this…you can omit the salt so it’s not so salty. In the crock-pot and it smells soooo gooood! So I did make this as promised the other night and it was DELICIOUS! I didn’t like it over rice though so we dipped our rolls in it instead. What’s better than bread soaked in something delicious! OH, and I added some chicken because I wanted a meat. YUM! Thanks for yet another fabulous recipe! We made this for dinner tonight and my meat loving husband asked me if this could be added into our monthly dinner rotation! My three year old even gobbled it up! I love curry flavors and I might even try freezing some of the leftovers to see if I could turn this into a freezer meal too! I think we’ll be eating this for weeks! I doubled the recipe because I thought the single recipe wouldn’t fill my crock pot enough. Good thing it will freeze! Can’t wait to try it. It smells delish! My husband recently has wanted me to try more meatless dishes so when I saw this recipe I knew I had to try it! I used regular lentils (since the first store I went to didn’t have the red ones and I didn’t have time to run to a second store) and it turned out wonderfully. We loved the flavors! My kids thought it was pretty yummy too. Thanks for a new idea and recipe. I carried these to work for lunch. Smell was delicious and people kept coming over to ask what it was. The best dahl I ever had was similar to this from a Pakistani stand-up restaraunt in Heidelberg, Germany. It’s been 10 years but the taste of the lentils and rice lingers on. It is something about the subtle flavors of the combined spices. If you want, you can cube potatoes and add to the beans. Makes them a little lumpy but more substantial. BTW, we keep ginger at the house all the time. when I am using a lot, I just put it on the shelf and slice off what I need. I also freeze it whole and store in a baggie. Grate it frozen. The skin doesn’t have to be peeled before use. It softens in the broth and you won’t notice it. Made Ginger-fig preserves this fall that go super well on biscuits. Made this for dinner this week (2 adults, 4 year old, 1 year old) and it was delish. My husband loved it and so did the kids. It served us twice for dinner plus 2 lunches for my husband for work. This is definitely going on regular rotation. Thanks! 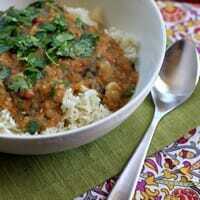 I love Indian food so this recipe really appealed and when I served it to my son’s Indian in-laws they loved it too. I just made this tonight and it is EXCELLENT!!! It was so quick to throw in the slow-cooker and it tasted so delicious!! Thanks for another great recipe! I made this with trader joes red lentils (130 calories per 1/4 cup) so 8 servings came to 170 calories each. Pay attention to the calories of the lentils you buy if that matters to you. Another bag of lentils I had at home was 60 calories less for the same serving! This recipe is delicious. I put extra curry paste and substitute chili powder for cayenne b/c I love it spicy. I also added cauliflower and purple cabbage to make it even more nutritious. I didn’t have spinach so I used red kale. Thanks for sharing this!! I forgot to tell you I made this a couple of weeks ago and it was so, so fantastically good. I ended up buying yellow split peas since they cost half as much as the lentils and they worked fine. I didn’t even bother with rice, just ate the concoction by itself every day until it was gone. I’m definitely keeping this recipe at the top of my lunch rotation. Thanks so much! Made this a few weeks ago and loved it! So did my 2 year old! We ate it all week. I have my 2nd batch in the crock pot now, and my mom is coming over for lunch to try it because I raved about it! Thanks ladies! I had never tried lentils before and I made this a few weeks ago and I loved it so much I have made it three times. Thanks so much for sharing it. I just ate some for lunch and it was tasty. The last time I made it I added some red bell pepper and carrots that was great too. This sounds delicious. Can you tell me what size crockpot you use? Thanks! I made this for dinner tonight. It was rather tastey. I did a few random changes out of lazyness from not going to the store-I used kale instead of spinach, and added fresh basil in addition to the cilantro. And instead of sugar-I added 1.5 cups of raisens. Then for fun, and cleaning out the shelf I added a rinsed can of chick peas. It was a huge hit, this is a definate super easy make again! Thanks for the post. Regarding the ginger issue…cooks illustrated did research on the best way to store ginger root. After much testing they reported (and I can concur) that you just throw the root into your fridge – no bag needed, just out in the air. I put it on the top ledge on the door -It will start to dry out, but it takes quite a long time to do so. Freezing it alters the texture and was deemed less desirable. Also – you peel the ginger (if you want to – I usually don’t bother if I’m grating it) using the edge of a spoon. Just scrape it along the root and the skin will come off. And great looking recipe! Thanks. I used green lentils (all three times I’ve made it now :)) and they turned out great-I served it over quinoa tonight and the texture of the green lentils plus the quinoa was great and really filling! Look delicious! I can’t wait to try this. How big is one serving? I just made this, and it is SO GOOD! I wanted something healthy for lunch but didn’t want to wait for my slow cooker, so I used my pressure cooker and cooked the lentil mixture for 4 minutes on high pressure. Delish! I’ve never really had Indian food or many recipes with curry in them, but I’m going to have to branch out. Thanks for another winning recipe! So, I made this earlier in the week, and I have to say–AWESOME…even though I forgot to add the lemon juice! I ended up using a mix of curry powder and garam masala paste. Came out great! I’d suggest picking up some chana dahl if you can–it may give it an extra boost of authenticity! Ginger could be ground with a little water into a thick paste and stored in the freezer in tiny ice cube trays. That’s how it is done in indian homes. You could just pop a cube or two and add to the pot while cooking. The other use of ginger is to strain the ginger liquid and use it with seltzer water or club soda with lemon for a sugarless ginger ale. Sweeten it if you like. Ginger soaked overnight in sugar solution and put in a dehydrater makes excellent ginger chews. After watching an Indian cooking show, I decided to turn the empty cooker on high and add a little oil at the beginning of the process in order to ‘blossom’ the seasonings which I added before anything else. I also added a little garam masala. Towards the end of the cooking I also added about 1/3 – 1/2 cup canned coconut milk, and left the cover ajar so the liquid would evaporate a bit. Delicious! First of all, so simple. Secondly, so tasty. I left out the sugar (unnecessary, especially for those of us watching our calories, etc…) and used kale instead of spinach for extra goodness! I also used vegetable broth instead of chicken broth. As a meat eater/lover/needer, I didn’t even feel like I was lacking anything in this recipe, as it is spiced perfectly and is very hearty! I ladled over a little bit of sprouted quinoa, YUM. You’re absolutely right about the # of servings, this would have made a monstrous 6 servings. This was yummy!!! It was the first time I’ve ever cooked lentils, and I will say I was surprised it was so mushy. Very hard to distinguish the lentils at all. Just wondering, is that how it’s supposed to be, or did I cook it in the crock too long? But the flavor was soooo good! I made this last night, but I’m wondering if I need to cook it longer? The lentils still seemed rather hard. This is my first time cooking lentils so I’m not positive how they’re supposed to turn out. When I’ve had them at restaurants in the past, they seem softer. One of my favorite recipes from you guys 🙂 so so good! Made this last night – fantastic! We don’t have a grocery store nearby with a bulk food section so I got the red lentils off of amazon for a decent price (using amazon mom and subscribe and save). So, this comment is posted way late, since I just found this recipe, but I do have a question about how you calculated the calorie content for this! I just whipped up a batch, and decided to count the calories myself, just in case any of the ingredients I used were way off. I’m afraid I’m coming up with a huge discrepancy between your numbers and mine for the calorie totals. The first thing that stuck out to me is the lentils. Going by the information on my packet, 45g is one serving, which is 150 calories. I measured out two cups, and it was about 388g, which is 8.62 servings. The 8.62*150 is a total of 1293, just for the lentils. So, even assuming that’s 8 servings of just lentils, the calorie content is already going to be over 150 calories per serving. Assuming my lentils are not labeled correctly, Google lists red lentils as 678 calories per 1 cup. Adding up all the ingredients, I came out with 210 calories per serving, at 8 servings per recipe. I’m not sure if anyone else has mentioned this, but I feel it’s something that should be pointed out. Literally just made this and super excited for dinner!!! 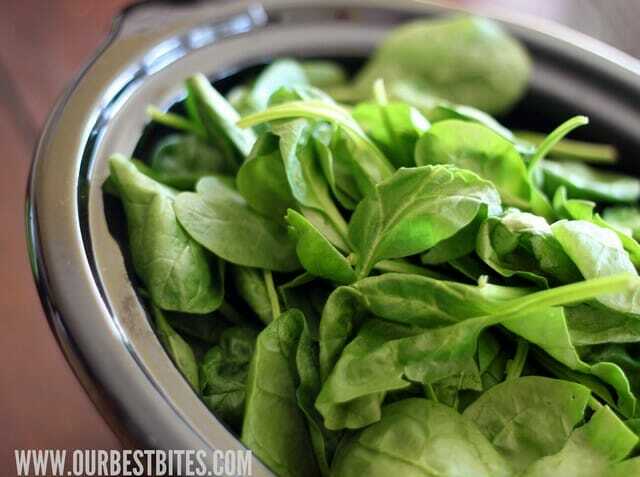 I left out the cayenne in deference to my kiddos and used 2 more ounces of spinach since I buy it in bags of 6oz. Otherwise I followed the recipe faithfully and it is sooooo good! Thank you so much! My family enjoys so many of your recipes and while I don’t always remember to comment, we are truly thankful! I’m making your butternut squash and lentil soup for Thanksgiving. It’s one of our favs!!! Oh! And I have eaten a rather disturbing amount of caramel corn since you ladies taught me how to make my own in the microwave. I add a tsp of pumpkin pie spice this time of year and it disappears in minutes! Thank you for making me look good in the kitchen! Happy Thanksgiving to you and yours! Thank you for a great dish. I was so super excited when you said it was from WW. I found you from a google search. I look forward to this one. I even already have the lentils. I wonder if you have tried to preserve this by canning it? It look like a great one to try when our tomatoes come in this fall. I was wondering that too. Canned lentils are already cooked, so perhaps it would be best to put them in the slow cooker towards the end of the cooking time. I love your web site. I have learned so much from it & appreciate your work. But the new changes in advertising is becoming too intrusive. There are so many distractions with moving ads and interruptions while scrolling through your recipes that it is difficult to concentrate on my purpose for being there in the first place. I am beginning to feel less drawn to turn to Our Best Bites for inspiration. I love this recipe! I have made this many, many times! The calorie count is off though like other readers have mentioned. It is around 200-210 calories per serving for 8 servings per recipe. You may want to change it on your site. Someone has entered the lower number in my fitness pal’s website as well. I’ve mad this in the crock pot a few times and it’s amazing. I’m under a time crunch and want to try it on the stovetop. I’m worried it won’t be as good though. 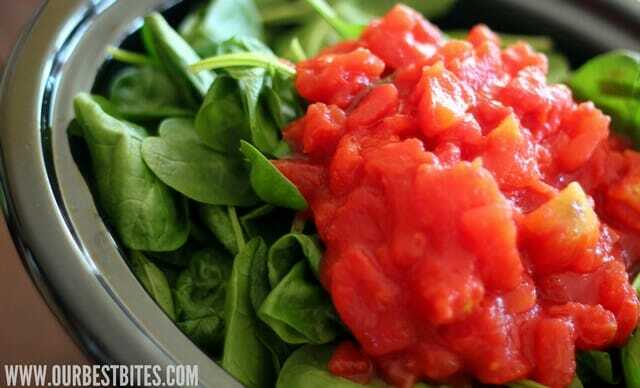 Have you tried it on the stovetop and is it as good as it is in the crock pot? I tried this again and oh my word, so good! The last time, I don’t think the lentils cooked long enough so I made sure to give them a lot of time this go-round. Such a difference, so tasty! And I omitted the sugar since I’m on a no-sugar-for-3-weeks detox and I couldn’t even tell. Still really tasty! Thank you!! This dish is one of my staples. I love it. Comes out delicious every time. Cant even count the number of times Ive made it. Just love it!